Both sides of the war - the Republic of Daranir and the Cirin Alliance - contract with free-traders and merchants to transport military supplies, based on the theory that unmarked freighters are less likely to be targeted by enemy warships. The problem with this theory is that both sides are now using unmarked warships - Privateers like Niobe - to take care of these unmarked supply ships. As a result the war has become a two-tiered conflict: "Official" battles between military vessels, and "Unofficial" battles between private contractors. 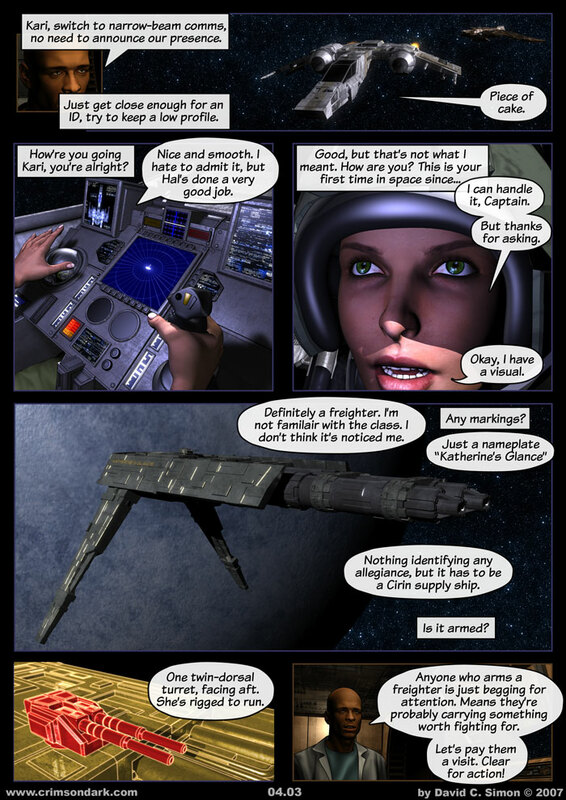 Another page which answers the "What was I doing during my two weeks off" question, showing off a new freighter and the remodeled Scimitar cockpit. Whereas I mainly improved the appearance of Niobe's controls, I almost completely redesigned the Scimitar's controls. This page also demonstrates a new step in my post-render Photoshop work, where I've started manually adding reflections in character's eyes because I'm not satisfied with how they render. "Clear for action" is an old naval term from the days of the old, crowded warships of the 18th and 19th centuries where the gundecks were also the crew quarters and the captain's cabin doubled as the surgery meaning that if the ship went into a battle all of the decks would need to be quickly cleared of daily detritus and made ready for action. In the context of Crimson Dark, it's basically the same as saying "battle stations! ".